Do you have general questions or not sure what's right for you? Visit our Frequently Asked Questions (FAQ). You're likely to find the most common questions answered there. Feel free to visit our Discussion Forum too where you can talk to other brewers building and using our design, or to ask general brewing related questions. You may also contact Kal directly at kal@TheElectricBrewery.com. We answer every single email, 365 days/year. If you do not see a response within 24 hours, please check your junk mail folder. Automated emails are sent at various stages as your order is processed from order acceptance to order delivery. If you do not see an email after placing your order (usually within minutes), please check your junk mail folder. Most orders ship within 1-3 business days. Our assembled products and kits are custom hand-made by us and some items have longer lead times: Up to 1 week for control panel kits and pre-assembled temperature probes/cables, 1-2 weeks for pre-assembled heating element assemblies, and 2-4 weeks for pre-assembled control panels. When you place your order various shipping options with different transit times are available. Please do keep in mind that the shipping transit time you choose does not guarantee an arrival time from the date of order, as there will also be a lead time for your product as mentioned above. Arrival time is lead time plus transit time. That said, when our customers choose expedited shipping we do try and get them out as soon as possible, often the same day for parts or similar short lead time products. You may also contact us directly about your order at sales@TheElectricBrewery.com. 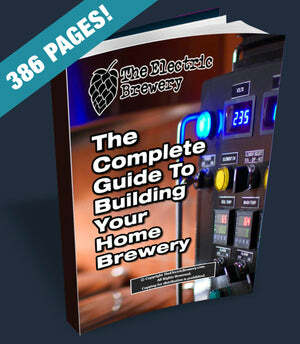 Did you purchase our Complete Guide to Building Your Brewery and did not receive download instructions? It can sometimes take up to 24 hours for payment to clear before your download link is sent. Please check your junk mail folder as well. The instructions were automatically sent to the email address you used when ordering. If you have not received instructions within 24 hours please contact us at sales@TheElectricBrewery.com and we'd be happy to resend you a copy. Please contact us at sales@TheElectricBrewery.com with any support questions. We support our products and customers for life. Doesn't matter if you purchased from us last week, last year, or when we first started in 2009. Doesn't matter if you purchased new or even used. We will not stop responding after your warranty runs out (a disturbing trend we're seeing with some sellers of electric brewing equipment). Most questions are answered the same day, 365 days a year. If you do not see a response within 24 hours, please check your junk mail folder. Please be aware we do not build products for other sellers, nor do we assist in the design, development, or support of products for other sellers. We can only assist with supporting our own products as featured in our online shop. Please contact us at sales@TheElectricBrewery.com with any warranty questions. A standard 90 day warranty is offered on parts and assembled products. Individual products may have warranties that supersede our standard warranty. Please refer to the individual product pages for complete details. Product warranties may be revoked if we determine that faults are due to misuse, abuse, or improper connection. Our standard return policy is 30 days since you received your item. Individual products may have return policies that supersede our standard warranty. Please refer to the individual product pages for complete details. To be eligible for a return, your item must be unused and in the same condition that you received it. It must also be in the original packaging. To return an item please email us at sales@TheElectricBrewery.com and we will provide you with a return merchandise authorization (RMA) number and return instructions. You will be responsible for paying for your own shipping costs for returning your item. Shipping costs are non-refundable. If you receive a refund, the cost of return shipping will be deducted from your refund. If you are shipping an item over $75, you should consider using a trackable shipping service or purchasing shipping insurance. We cannot guarantee that we will receive your returned item. Refunds: Once your return is received and inspected, we will send you an email to notify you that we have received your returned item. We will also notify you of the approval or rejection of your refund. If approved your refund will be processed, and a credit will automatically be applied to your credit card or original method of payment. Exchanges: Bought the wrong part or size? If you need to make an exchange please email us at sales@TheElectricBrewery.com and we will work with you to make things right. Please contact us at sales@TheElectricBrewery.com with any questions about returns.